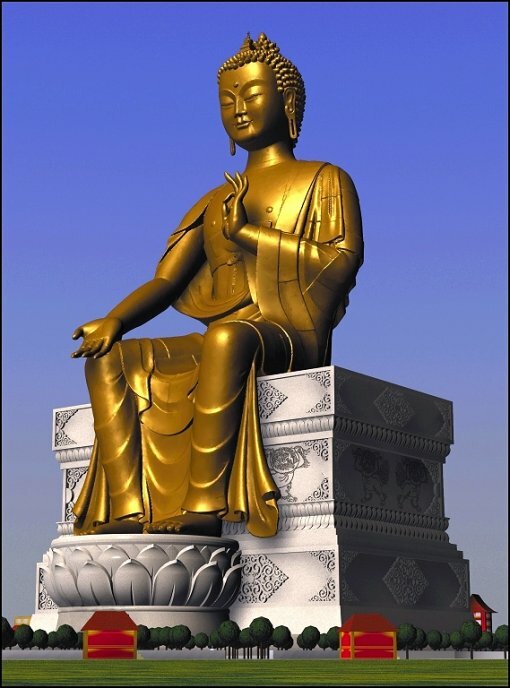 Subject: News Article "Building a Better Buddha"
British Engineers are designing the world's biggest statue, intended to stand well into the next millenium. 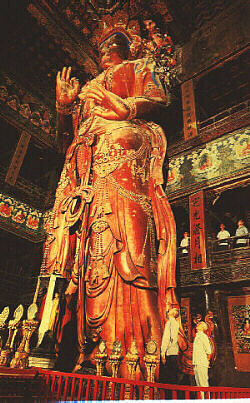 At 150 metres, the MAITREYA BUDDHA would be three times as tall as the Statue of Liberty when it is completed in 2005. The plan is to make it from 3000 two metre-square bronze panels, each weighing abaout half a tonne, bolted and welded to a tubular skeleton. THE CONSTRUCTION AT BODHA GAYA IN NORTHERN INDIA. It will be a major feat of modern engineering. One problem that must be solved is the optimum thickness of the plates. Each millimetre adds $2.5 million (Cdn) to the cost, already estimated in the hundreds of millions. Engineers will also have to deal with extreme temperature variations that will cause the statue to expand and contract by up to 30 centimetres a day. BUDDHA WILL BE SEATED ON A THRONE 17 STOREYS HIGH, HOUSING A HUGE TEMPLE WITH THE FEET RESTING ON A LOTUS, TOUCHING THE EARTH AND FORMING THE ENTRANCE. The new Buddha was a dream of Tibetan Buddhist master Lama Thubten Yeshe, who died in 1984 after establishing a global network of Buddhist centres.